When I say ‘bend over and take it’ I’m envisaging the difference between form and function in combative posture. In many of my application pictures there is a noticeable difference between my posture in paired work and that in the solo form of the kata. As karateka gain experience they learn that stances naturally adjust according to need, and as a result they may become longer, higher or deeper as circumstances dictate. Different applications or variables will cause shifts between what we recognise as stances, so while a form might illustrate a movement in a front stance or a cat stance, circumstances may dictate something more akin to a rooted stance, a back stance or a straddle stance. Eagle eyed readers of my blog or my books might have noticed that invariably, when I am in tactile contact with a training partner, or following through, I never hold my back at a right angle to the ground. This is not accidental ‘bad posture’ nor is it the result of an injury. 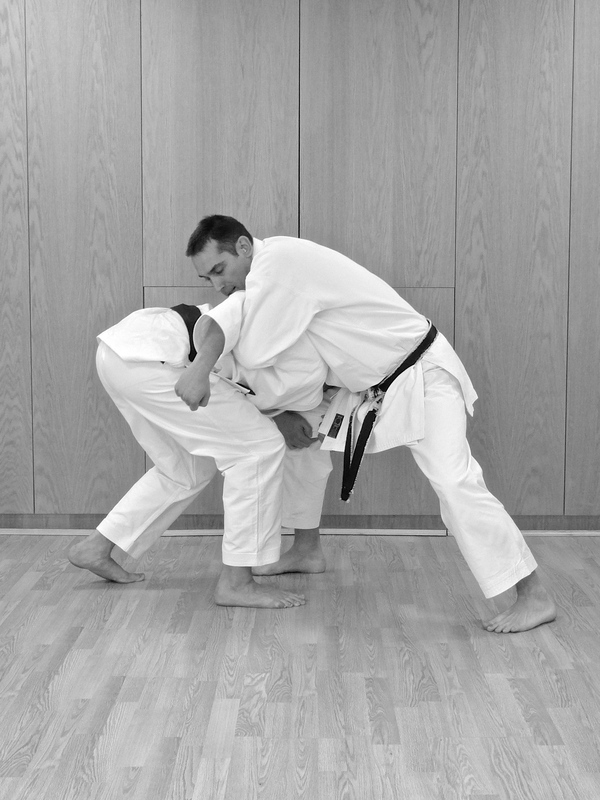 Often this is the case when the level of tactile contact shown in the photo is minimal, because at the start of the movement a fair degree of weight was actively driving against me. No matter how good your stance or footwork is, having a straight back while resisting physical force from another person is biomechanically unsound. The greater the level of force you are resisting, the more necessary it is to brace appropriately to take the load properly without placing undue stress in the small of the back, or compromising your balance, and in general the greater the angle of back (and depth of stance and thus angle of shin) required. There is a difference between lifting an object and exerting or resisting force along other planes of movement. You may be able to push a car with a straight back once you have got it moving, but to initiate the push the optimum position is to lean forward. You would not see a rugby scrum lock together bolt upright. Excellent! This is spot on. Freeing the mind form having to look “correct is a real game-changer. Thank you, sir.